The most important thing that has been done – is is a simple tests, to ensure that the Map is working properly. Shame on me – there were several bugs in initial implementation, but due to tests all of them (I hope 🙂 ) was fixed. In discussion thread on google groups, Sven Bergström said: “In my cases I found that shielding map iterator with a simple length check gave me a huge bump in performance on c++ target”. In my point of view, this makes sense on js also, and currently FastIteratingStringMap will return special static emptyIterator in that case, so no memory will be allocated when there is no data in the map. Initially, I use single benchmark function, which accepts Map.IMap<String, Int>, and several creator functions, which returns new map object. However, this approach didn’t allow Haxe to use it powerful optimization techniques. Currently benchmark was generated via benchmark generator (macro would be more haxeish, but generator is simplier). Every benchmark function has it own variant for each Map realization, and now Haxe can inline various functions, especially for NewStringMap (StringMap from Haxe 3.2). Along with specific class instantiation, this give more performance boost for NewStringMap. Also I added “inline” modifier to get / set / exists functions of OldStringMap, to allow old map code to use improved Haxe 3.2 optimization techniques. Doubly linked map was not the only one idea of implementation. Another idea is to use NewStringMap code as base, and additionally keep array of keys. Although idea was promising, it turned out that removing from map is terribly slow in all browsers except Chrome. 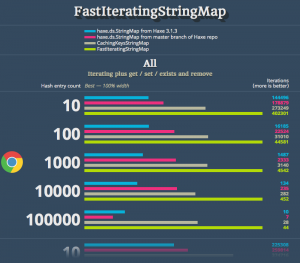 As you can see, FastIteratingStringMap has pretty good performance, it even somehow beat OldStringMap and CachingKeysStringMap in “Without iteration” benchmark on Chrome (JIT is magic 🙂 ). It’s just a coincidence. Although I did not have the goal to have a guaranteed iteration order, it turned out that this is the most efficient way to have fast iterators.